Bank account registration requires two (2) unrelated signers that have passed background checks. You are an authorized signer on the Troop/SU bank account. The Troop/SU account is set up using GSNETX council tax ID. You accept responsibility for depositing sufficient funds in the Troop/SU bank account to cover ACH transactions at least 3 business days before the transaction is due to occur based on GSNETX’s Product Sales guidelines and processes. You authorize GSNETX to repeat ACH transactions that fail for any reason. Any monies due to your Troop/SU from GSNETX will be credited to your bank account via ACH transaction. Only use the routing number from a check. Do not use a deposit slip. A deposit slip is for internal use only by the issuing bank. Did we mention to only use the routing number from a check? 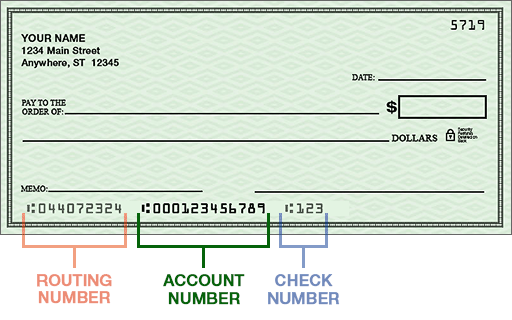 Is located at the bottom center of a check - to the right of the routing number. Can be any length as they are used internally by the issuing bank.